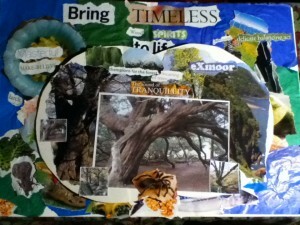 A vision collage preparing for woodland events, using photos of ancient woodland. 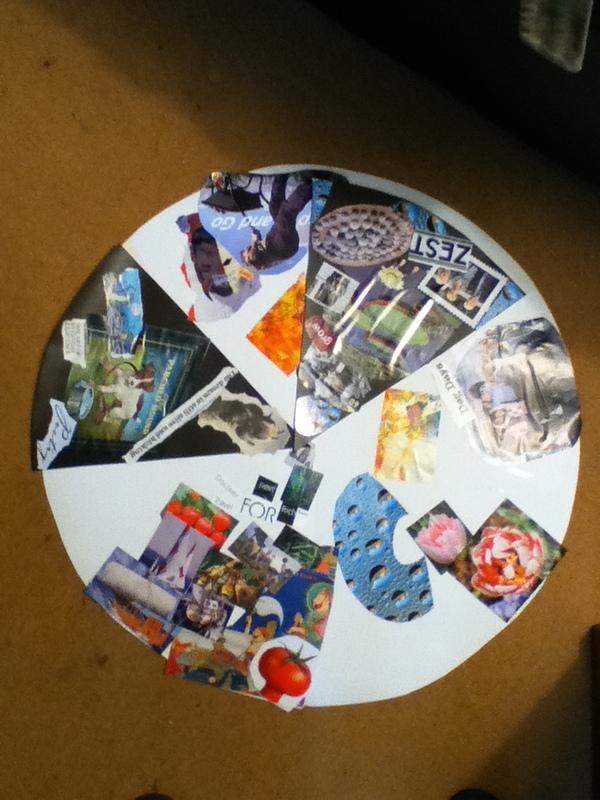 This group mandala was made after improvised poetry and a group song was created from the key images from each person’s poem. Making a Natural Mandala with Improvised Poems and Song. 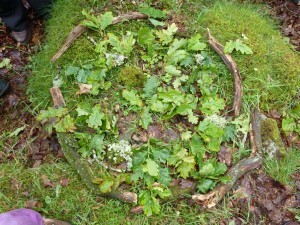 The Mandala symbolised the Spirit of Place in the ancient Dwarf Oak woodland. 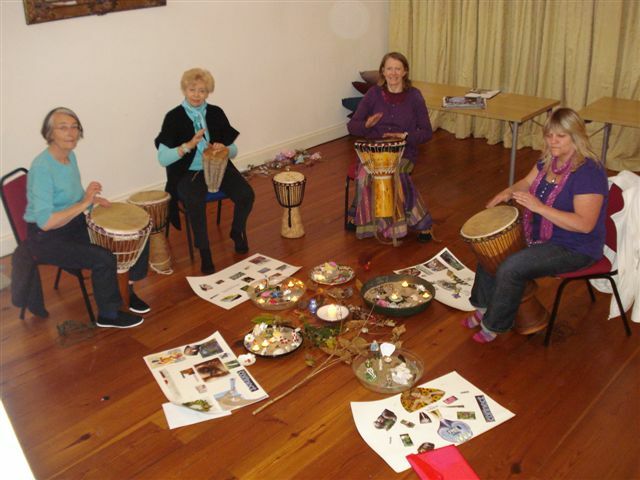 The mandala centred the groups insights and sense of atmosphere, and symbolised a sense of magic and awareness. Sandtray Visioning Mandalas encapsulate a vision and can be activated as a moving 3D symbol. 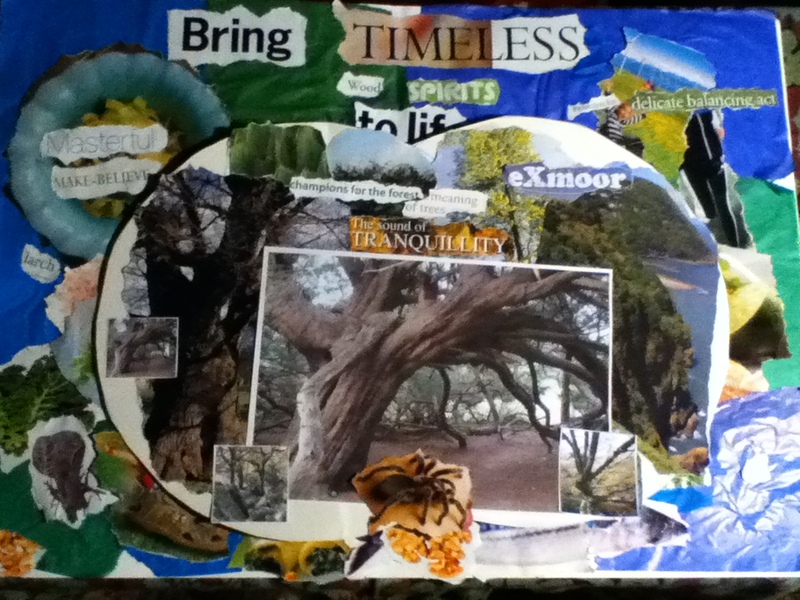 This is a way of healing the family tree through a constellation of symbols and images that are given a voice in Creative Journal. Improvisation with poetry in a parachute tent, in the ancient trees of Burnham Beeches. 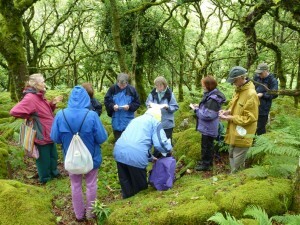 Improvisation with mask, after creating poetry and song, wandering the ancient woodland in sympathy with the trees. Making a collective collage with clay, paint and montage symbolising group vision for children’s play. 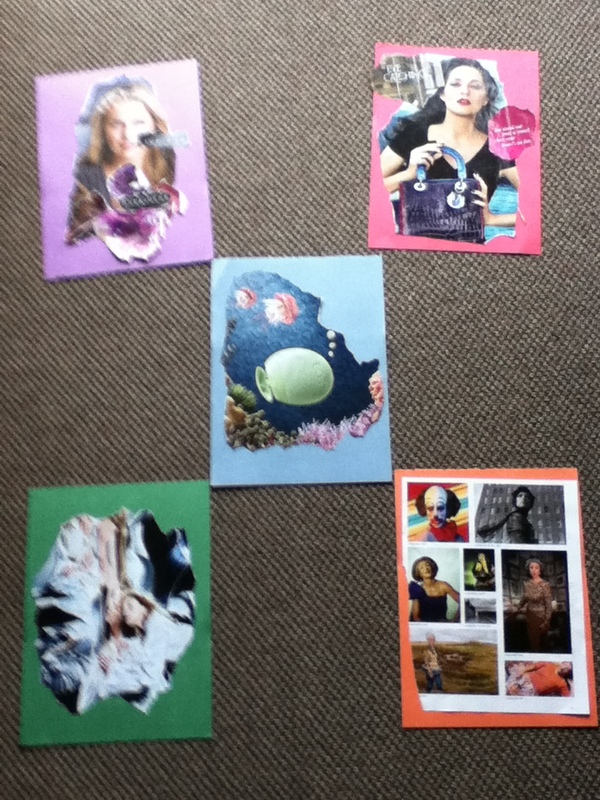 Group Collage can be used as a symbol for future work with children and parents. Play and Parenting group collage. Creative Journal Expressive Arts training group in Texas. 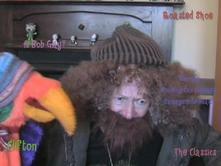 Foolish faces reflect a deep insight into human role playing. 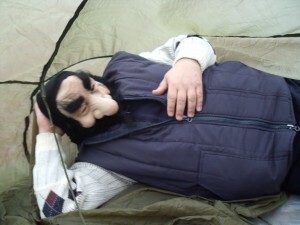 Latex face changing, using the Inner Fool. Home Education involved the empowerment of a deep passion for drawing and characterisation of the world of human wierdness. 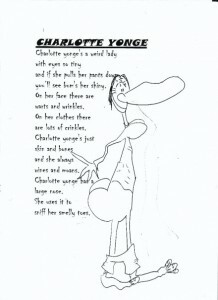 Making drawings that became the basis of computer cartoons. 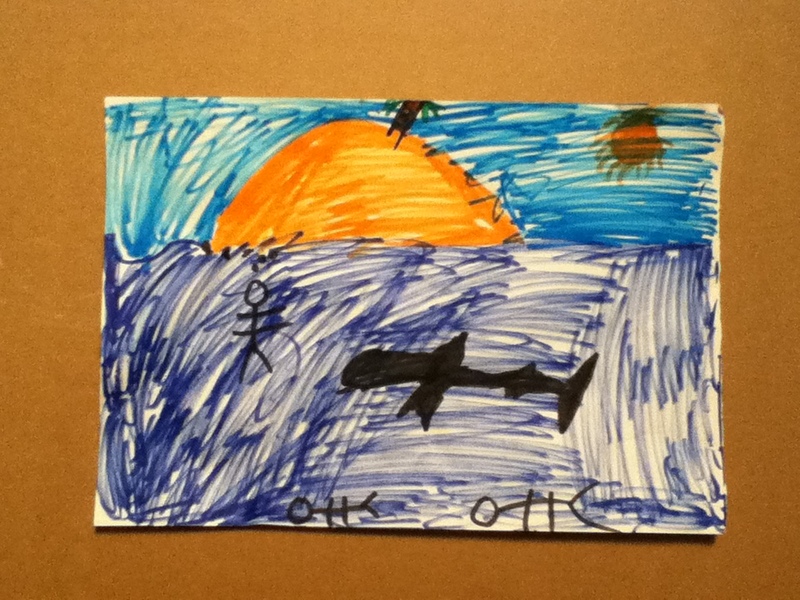 At School – Rude Poems by a gifted young learner of 9 years who rebels against the system. 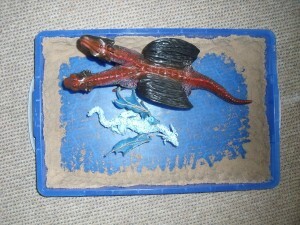 NON DIRECTIVE PLAY AND CREATIVE JOURNAL FOR LEARNING SUPPORT IN SCHOOL. 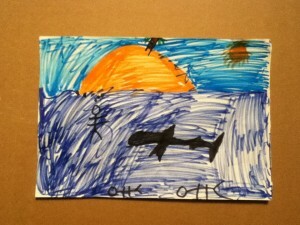 The Shark is one boy’s statement of a difficult school experience. 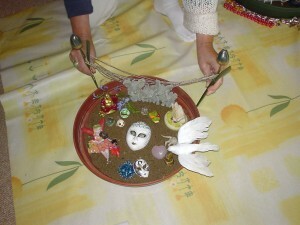 Characters and puppets formed the curriculum for the emotional literacy development for a gifted child in home education. 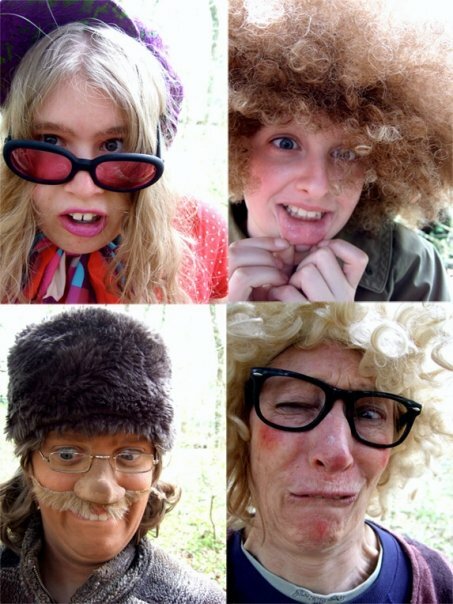 The use of characters and narrative used both in home education and non-directive play at school. This was created in a non-directive play sesssion as a learning support for a child of 8 yrs who was having difficulties integrating in infant school. Two dragons trapped symbolised a young learner’s feelings about school. 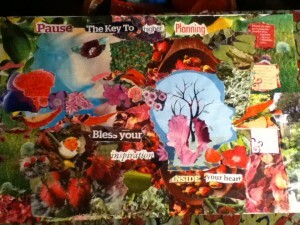 Vision Coaching training involved setting a goal, and this collage shows the integration of the right and left brain, at the heart of Creative Journal and Vision® Coaching. 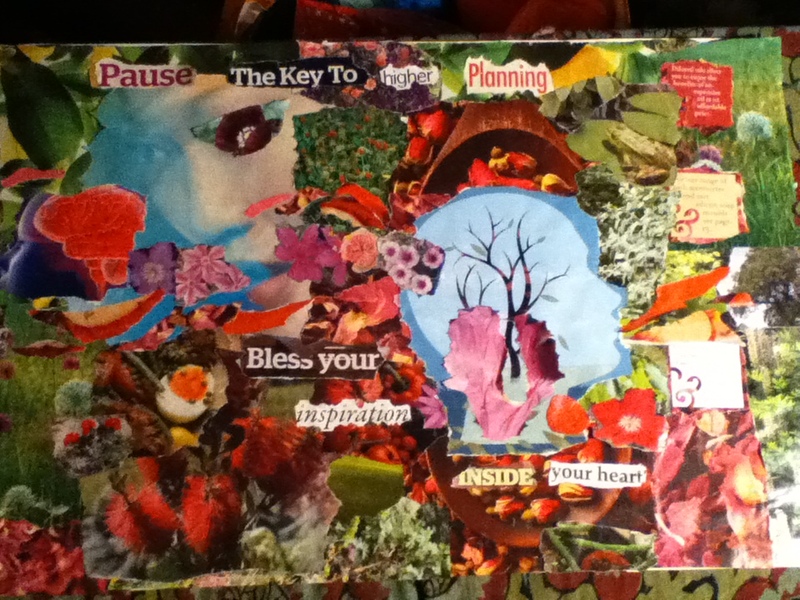 A Mini Collage, ‘Health’, made of contrasting felt and photo montage. The Spider Weaver is a symbol of my Creative Self as work integrating many aspects of my life. Matwork uses simple foam mats to symbolise different aspects of an issue, which the participant can stand on and speak through intuitive identification. Using Mini Collages is one way of getting visual enhancement for the quality depicted, in support of intuitive resolutions. 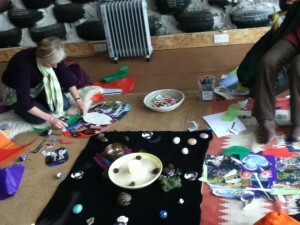 These were made to be mats, so that each theme could be ’embodied’ and explored intuitively. Mini Collage montages help to identify aspects of a problem that cannot be put into words, and then used as mats for role play. 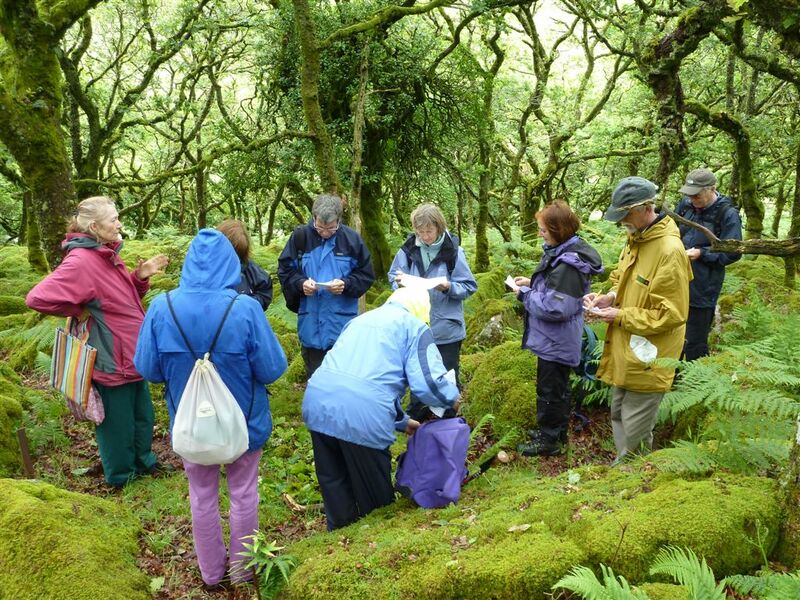 Visioning is used as spiritual workshop activities to develop themes of creative cycles through the seasons, starting with planting a seed idea at Christmas (Rebirth in the Celtic tradition). Making a Vision Collage: The Vision Collage in the making, around a mandala to create symbolic space. Click HERE to see a video of the workshop. At the Phoenix Centre, Suffolk, Creative Journal and sandtray mandala expressed a heart-felt healing wish, and drumming completed the day celebrating new changes and visions for our personal lives. Rhythm and movement brings a sense of empowerment and commitment to action, through the reverie created by resonance and rhythmical movement. Clay is a muscular medium in which to experience somatic roots of the feelings, and embody the intuitive self’s resolution to a conflict. 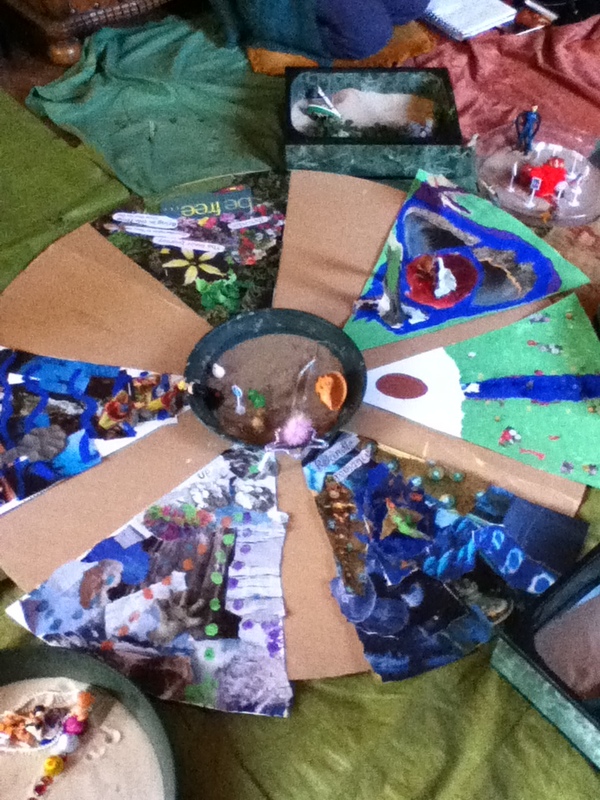 It is supported by Creative Journal, with role play, matwork, and vision collage to further explore a future goal, and the inner dialogue of the Critic. 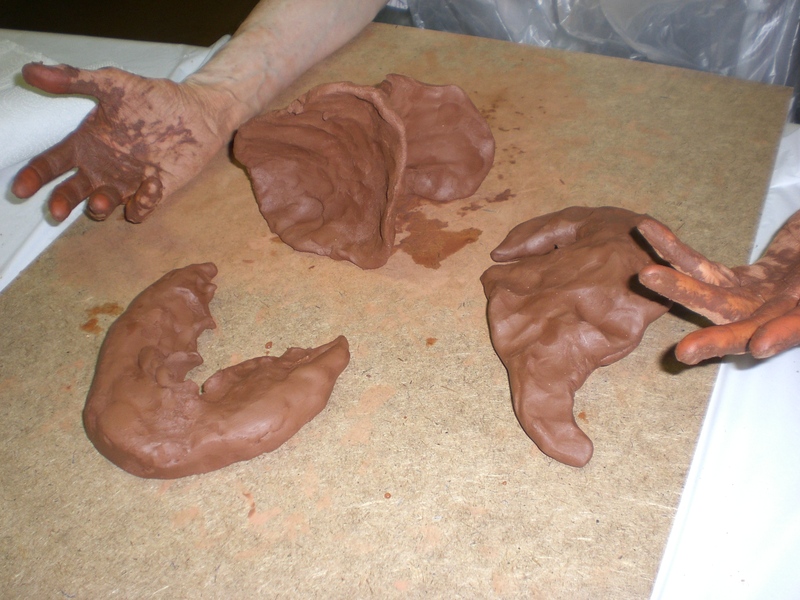 Three pieces of clay represent the origin, central isue and resolution of a problem. 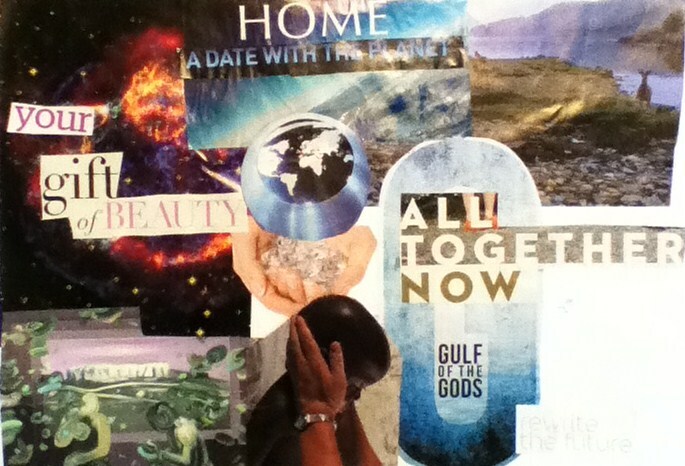 A spiritual vision collage reflecting a dream of harmony, compassion and peace. As in the wisdom traditions of old, the cycle of the seasons gives a perfect eight stage process for making you dreams come true in your life. The winter is where we incubate our seed vision for our heart’s desire; spring is when we pour our attention onto the sprouting seed; Easter is when we affirm our gifts and talents in the face of obstacles (usually the Inner Critic); May is the time to get support and form a ‘dream team’ of friends who share our dream themes; summer is when we protect and make boundaries for our plan of action and support; autumn is when we start acting out our vision and getting immersed in creative reverie; winter is a time of reflection and celebration, acknowledging the new insight and seed vision for the coming year. 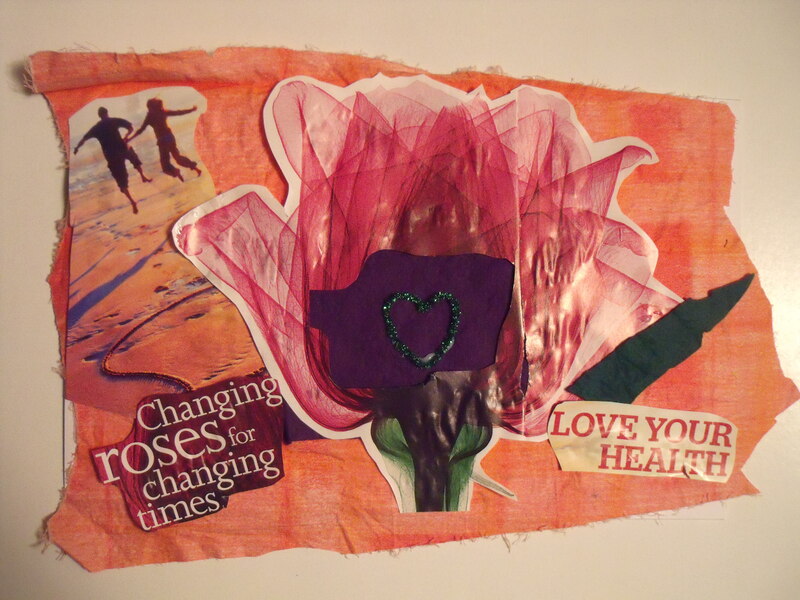 Now is the time to find a way of living from our hearts, using Creative Journal and Expressive Arts such as collage, rhythm, mandala and sound to empower our deeper values. Watch this space for dates.